Feels like new, reliable 2011 Honda Civic keeps going without major issues. I bought my car on a six year lease and have never experienced any major issues. I bought the car in 2013 and it is mileage was at 36, 000. It is now 2018 and I am at 102, 500. Only now have I had some issues with the air conditioning and heat system. I keep up with all my maintenance work including oil changes, transmission oil, power steering, tires, and brakes. To only now start having a problem with the cooling and heating system is amazing! I love how quick it picks up speed and how there is a digital screen to tell you the mph. It also feels bigger than what it is. This Honda Civic has never let me down! I plan to drive this car until it cannot drive anymore! The Honda Civic has it all. The Honda Civic coupe is all in all a great car and if you keep up with the maintenance, the car will treat you right. The interior is clean and comfortable for an economy model. 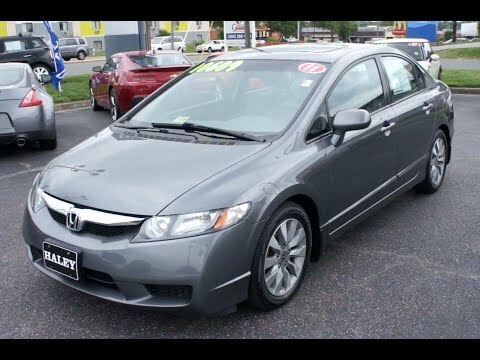 I have owned two used Honda Civic couples cars (2009 & 2011- including a salvage) and they have both been secure and reliable. After the first 100k or so miles, the car begins to develop a few issues that could spiral if not addressed immediately. The ac broke in my first car and my second car begin to vibrate and rattle loudly without cause. Because of the front wheel drive and sports-nature of the car, limited driving is recommended during snowfalls and on mountains. A reliable car that lasts. I am very pleased with its handling. Being 5’1”, every vehicle does not fit me. There is plenty of room for four people, and that is including two car seats. The gas mileage is great. It saves a lot of money. The driver's seat is easy to make to fit your size. The traction on curvy roads is great. It can handle the country roads where I live. It is also a car that does not break the bank to purchase. And the resale is also a positive. These cars have a good name even with the car technician’s. They are known to last if you service them, and known to be safe.